Iroshizuku Tsukushi. Click to enlarge. Iroshizuku is a line of ink produced by Pilot under their high-end Namiki brand. The natural landscape and plants of Japan inspire the colors in the line, resulting in some of the most interesting and unique ink around. Some of my earliest reviews were of Iroshizuku ink: Yu-Yake, a delightful burnt orange; Momiji, an incredible, if subtle red; Yama-Budo, a ripe, juicy purple; Kiri-Same, the color of storm clouds in a bottle; and Kon-Peki, a deep and intoxicating ocean blue. To mark my recent return to ink reviews after a two-year hiatus, I just reviewed Asa-Gao, which is a daily-writer-worthy vibrant blue. Returning to this line of ink made me remember just how much I love it. I’ve collected lots of ink over the years, which means that the average tenure of any particular color in my daily writer is probably one month, if not less. As a result, many of the Iroshizuku inks that I collected early on have sat, lonely and unused, for a few years. So, when I went to choose the next ink in my rotation, I picked an Iroshizuku ink that I had owned for years but never reviewed: Tsukushi. Tsukushi means “horsetail” in Japanese, and can refer to either the horsetail plant or to a wooden stick with a burned tip that’s used to create under-drawings for artwork. According to Pilot, the ink is “a soft brown, like a young horsetail awaiting the coming of spring,” which I assume refers to the plant, as the idea of a burnt stick waiting around for spring can only be explained by artistic bears coming out of hibernation and then sleepily marching into the studio for a quick sketch before wandering off to hunt salmon. At any rate, Tsukushi is a medium brown with a hint of earthy red. It’s moderately saturated, and does exhibit nice shading with both a fine nib and a wide stub nib. As a wet writing ink, it provides sufficient lubrication across a variety writing surfaces. As a line, Iroshizuku ink behaves best on high quality, ink resistant paper like Clairefontaine, Rhodia, or Midori. Because most of the colors are wet-writers, they have a tendency to feather on cheap, absorbent paper like bagasse or copier paper. Tsukishi squarely fits the pattern, as seen by its behavior on the various papers I tested it on. Iroshizuku Tsukushi water test. Click to enlarge. Tsukushi held up better than I expected during tests of its water resistance. On the smear test, in which I drag a wet finger across the page, the ink certainly smeared – the red compounds in the ink splayed across the page – but the underlying lines still remained legible. On the drip test, in which I let a few drops of water sit on the page before blotting them up, the ink bled slightly and some came up off the page, but it still remained readable. Iroshizuku Tsukushi bottle. Click to enlarge. Iroshizuku bottles remain one of the loveliest designs in the field. Each beautiful, 50ml bottle brilliantly showcases the color of the ink it contains. They are quite solid and the thick bottom gives each one a surprising amount of heft. Also, an indentation in the bottom of the bottle is intended to aid in soaking up the last few drops of ink. These are bottles that deserve a place of pride on top of a desk. Brown inks have not been in my regular rotation for the past couple of years, but my time with Tsukushi is making me rethink that – especially as we head into autumn here in the US. It’s well-behaved ink with nice shading in a color that I haven’t yet found elsewhere. It’s not cheap – Iroshizuku ink runs about $28 (US) per bottle – but from its time in my pen, I’d say that it’s worth it. Review notes: The hand-written portions of the review were created on 80 g/m2 Rhodia paper from a No. 18 Bloc pad. The flourished italic script was written using a Monteverde Prima with a 1.1mm steel stub nib, while the remainder of the text was written using a Visconti Homo Sapiens fitted with an EF palladium nib. I’d like to begin by offering a hearty apology to the fine folks at Jet Pens, who sent me a bottle of Iroshizuku Asagao all the way back in October of 2013. At the time, I thought that I could sneak in an ink review in the middle of my EMBA program. That was a gross over-estimation of time and ability on my part. I managed to get the ink samples created, but the review itself never materialized – always de-prioritized in favor of papers, presentations, and projects. I’m finally back, though. My brain has recovered, and, for my first foray back into the reviewing realm, I’m delivering the long-overdue review of Iroshizuku Asagao. The morning glory was first identified in China, where it was used for medicinal purposes. It was introduced to Japan in the 9th century, where it became cultivated for its ornamental properties. It became such a popular flower in Japan that the Japanese now lead the world in developing new varieties of the plant, producing a multitude of colors. Asagao is based on the most common color, though – a lovely, vibrant blue. It is highly saturated ink that produces significant contrast on bright white paper, and exhibits low levels of shading when used with a fine-nib pen. The ink performed modestly across a variety of paper types. On Rhodia paper, which is very fountain pen friendly, the ink dried in 4 seconds, and displayed moderate feathering. Show-through and bleed-through were both moderate as well – manageable, but one wouldn’t want to use this ink to write on both sides of the page. It performed reasonably well on cheap copier paper, where it dried in 1 second, and had low to moderate feathering. It had above average levels of bleed-through and show-through, though. Asagao fared the worst on Staples’ bagasse, where it dried in 2 seconds, but exhibited extraordinary feathering, and had high levels of bleed-through and show-through. Asagao is the first Iroshizuku ink on which I’ve conducted a water test, so I wasn’t quite sure what to expect. They are not advertised as possessing any significant water resistance, so I had no idea whether it would wash out easily, or hang on tenaciously. Overall, it did reasonably well. The smear test, in which I run a wet finger over the page, turned the lovely blue lines into a lovely blue smudge. However, the original lines remain legible beneath the large blue smear – the information is preserved, even though you wouldn’t want to hand the paper over to anyone you wanted to impress. The drip test, in which I leave drops of water on the page for a few seconds or so before blotting, caused the lines to feather and some ink to be blotted up, but the sample was still readable. The soak test, in which I run the paper under a stream of water for thirty seconds in an attempt to wash the ink off the page, did rinse a great amount of the ink away. However, enough remained behind to be completely legible. Iroshizuku bottles remain one of the loveliest designs in the field. The beautiful 50ml bottle brilliantly showcases the color of the ink it contains. It’s quite solid and its thick bottom gives it a surprising amount of heft. An indentation in the bottom of the bottle is intended to aid in soaking up the last few drops of ink. When I first put Asagao into my pen, I felt as though it was missing something. It was vibrant, lovely to look at, and well behaved, but it didn’t quite have the unique character that many other Iroshizuku inks seem to possess. They’re colors that you just can’t find anywhere else. Then I realized that, as much as I love those inks, they never make it into my regular rotation. Asagao, on the other hand, would be perfect for daily use. It’s a little bold, especially on bright white paper, but on the cream-colored paper of a Moleskine or Midori notebook, it mellows and really comes into its own. If you like Iroshizuku inks, and you’re looking for a daily writer, then Asagao might be the one for you. Iroshizuku Asagao is available from a number of sources, including the fine folks at Jet Pens. Review Notes: The hand-written portions of the review were created on 80 g/m2 Rhodia paper from a No. 16 Bloc pad. The flourished italic script was written using a Lamy Joy fitted with a 1.9mm steel nib, while the remainder of the text was written using a Visconti Homo Sapiens fitted with an EF palladium nib. 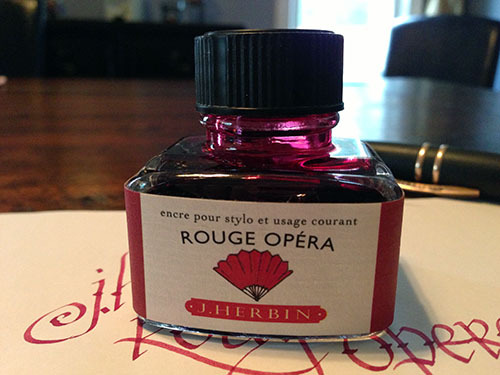 J. Herbin Rouge Opera should come with a warning. If you fill your fountain pen with it, you will, in short order, develop a compulsion to listen to Puccini, Verdi, and, perhaps, Bizet. The ink is the color of a heavy, velvet stage curtain and of walls lined with brocade. It's the color of soprano Anna Netrebko's dress in the 2005 staging of La Traviata. It's each of those shades from moment to moment, and it's all of them at once. Just try to avoid humming a little Wagner once your pen is inked up. Practically speaking, the color is a dusky red with a hint of maroon. It exhibits a high degree of shading that ranges from brick red to a dark pink. Rouge Opera's behavior, pleasantly, is decidedly less melodramatic than its color. It took 4 seconds to dry on Rhodia paper and Staples bagasse. On cheap, office-grade copier paper, it dried nearly instantaneously. 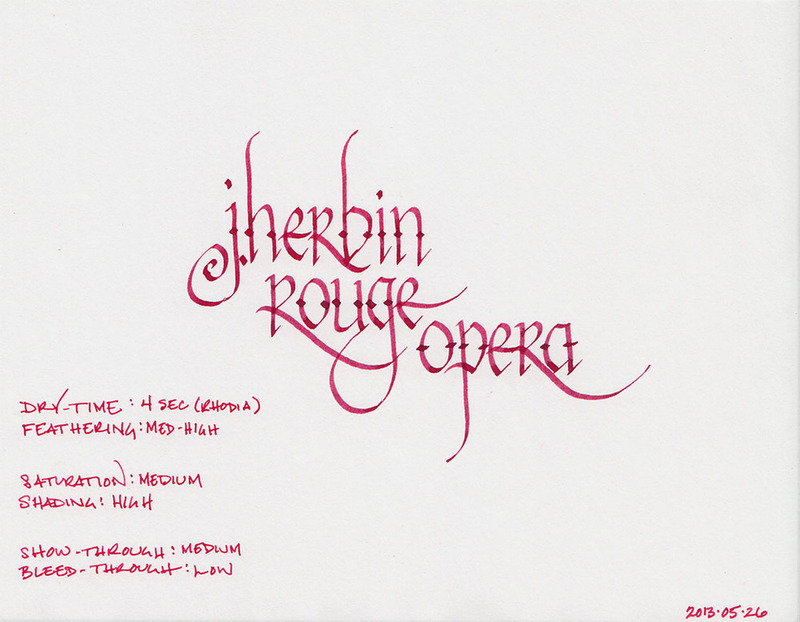 Like many of the J. Herbin inks, Rouge Opera exhibits a high degree of feathering on low-quality paper. Bagasse fared the worst, with my Visconti Homo Sapiens producing a medium-weight line from a fine nib. On copier paper, the feathering was noticeable, but tolerable. As always, Rhodia and Clairefontaine paper fared the best. On Rhodia and Clairefontaine paper, Rouge Opera results in low levels of bleed through and moderate show-through. I noticed significant bleed-through and show-through on both Staples bagasse and on copier paper, however. It is something to be aware of if one's intent is to use both sides of a page. Most J. Herbin inks that I've reviewed have not been on speaking terms with water. Bleu Pervenche, for example, ran screaming at the slightest hint of moisture, and Terre de Feu faded into the background, leaving only a shadow of its former self behind. I was expecting the same behavior from Rouge Opera, but was, quite frankly, astounded at how it actually responded. The smear test, in which I run a wet finger across the page, did result in significant smearing. However, as you can see, the words on the page are still completely legible – most of the ink remains bonded to the paper. The drip test, in which I let droplets of water sit on the page before blotting them up, resulted in feathering and lightening of the lines, but still left the words completely legible. The soak test was the most surprising of all. While some ink washed away, and what was left feathered noticeably, all of the words are still completely legible and visible. I suppose one could refer to it at this point as Rouge Operetta – still of exceptional quality, just a little bit lighter. J. Herbin fountain pen inks come in a 30ml bottle with an integrated pen rest that is suitable for displaying on top of one's desk. The red label on this bottle is fairly representative of the ink inside. Rouge Opera is a beautiful, dramatic, and on certain types of paper, well-behaved ink; it's certainly a color that lives up to its title. The excellent water-resistance is an unexpected bonus that puts this J. Herbin ink over the top. Keeping the high degree of feathering on poor quality paper in mind, I highly recommend it. Review Notes: the fine lines were made with a Visconti Homo Sapiens pen with an extra fine 23k palladium nib. The bold lines were made using a Lamy Joy calligraphy pen with a 1.9mm steel nib. The paper is 80gsm from a Rhodia Bloc Pad. J. Herbin makes watercolor-lovely ink. Some colors, like Bleu Myosotis, give the impression that the viewer is looking at a field of wildflowers through a set of gauzy curtains in the pale light of a spring morning. Bleu Pervenche, on the other hand, places the viewer on a rocky outcropping, gazing out at the blue-green waters of the Mediterranean, one hand against the brow to shield his eyes, squinting in the summer sun. It's an extremely lovely, bold color, even if it is puzzlingly named. Pervenche means periwinkle in French, and this color doesn't resemble the periwinkle that I'm familiar with in the slightest. It's not a light blue-purple, but a bright, bold blue that leans toward the green end of the spectrum (as opposed to the purple end). I prefer to use new ink for a week or two before I review it. In this case, I cleaned the Noodler's Black out of my trusty Visconti Homo Sapiens and filled it with Bleu Pervenche. While few inks are as smooth as Black, I was pleasantly surprised at how well Bleu Pervenche handled. It is wet-writing ink, which allowed the pen to move easily across the surface of most paper types I used. The ink exhibits a high degree of feathering on normal copy paper and Staples Bagasse. It generally behaves well on coated papers like Rhodia pads or Clairefontaine notebooks, but does feather when using wet-writing pens like the Pilot Parallel calligraphy pens in the writing sample above. Like most J. Herbin inks, saturation is low, which enables the loveliest characteristic of Bleu Pervenche to shine: the high degree of shading that it exhibits even in fine-writing pens. Show- and bleed-though were both moderate on Rhodia paper, though I didn't notice it at all on slightly heavier Clairefontaine notebook paper. 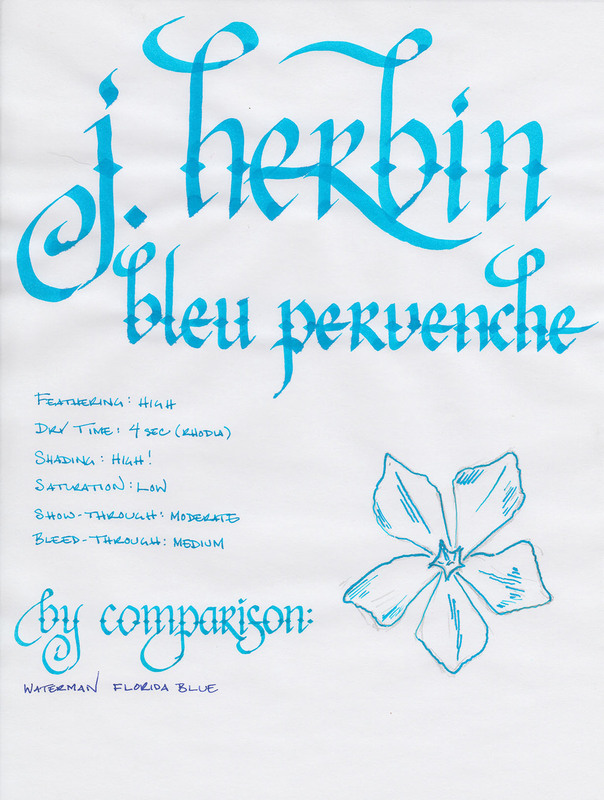 J. Herbin inks aren't known for being water resistant, and Bleu Pervenche is no exception. When I ran my wet finger across the page for the smear test, it erased most of the lines, and left a blue haze in its wake. The drip test, in which I let a several drops of water sit on the page for a minute before blotting them up, wasn't much better – most of the ink came up with the blotter. The soak test, where I run the paper under water for thirty seconds, was the most impressive of all – nearly all of the ink was washed away, and only the faintest of lines remains. J. Herbin fountain pen inks come in a 30ml bottle with an integrated pen rest that is suitable for displaying on top of one's desk. The bottles are slightly challenging to use with a large-nibbed pen, though – I had to tilt the bottle to get a deep enough well to fully submerge my pen. 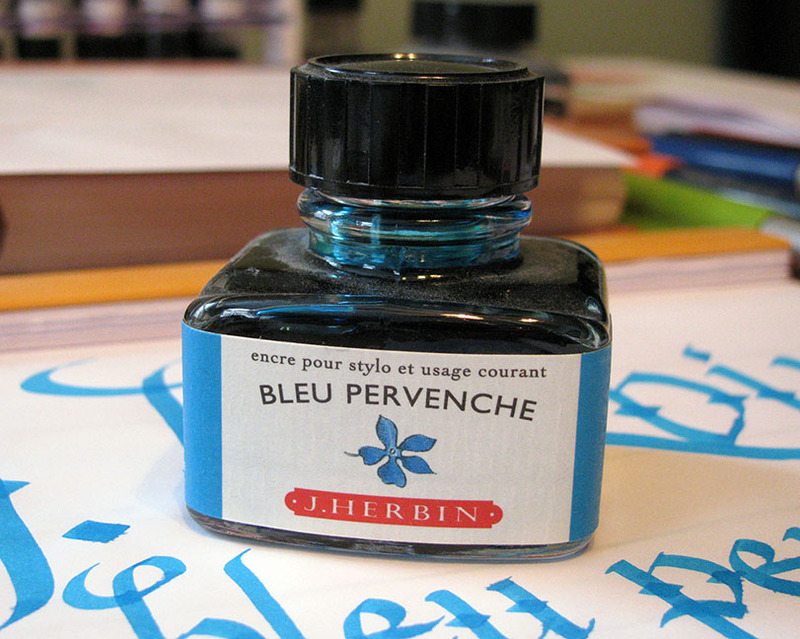 Despite the high degree of feathering and the logistical issues of the small bottle, I have no hesitation in recommending J. Herbin Bleu Pervenche for those that enjoy bold, vibrant colors. It's nearly impossible to be unhappy when writing with this ink. It's an instant pick-me-up, and worth picking up to add to your collection. Review notes: The fine lines were created by a Lamy Safari that was equipped with a steel EF nib, the medium lines with a Lamy Joy 1.9mm calligraphy pen, and the broad lines with 6.0mm and 3.8mm Pilot Parallel calligraphy pens. The paper is bright white, 80gsm, from a Rhodia Bloc pad. There are many good things to say bout the Goulet Pen Company, but one of them is the degree of care they take in packaging items for shipment. Most bottles of ink are individually wrapped to insure against leakage, then are wrapped in several layers of bubble wrap to prevent them from getting banged around, and then again in plastic wrap to protect them against the elements. As you might expect, I've never had any item arrive in a damaged state, despite packages being left in the rain, left in the snow, and left in the rain/snow combination whimsically referred to as a "wintery mix." Beyond the care taken, though, the most distinctive thing about a shipment from the Goulet Pen Company is the bright, blue packaging material. If you've ordered from them before, you'll know exactly what I'm talking about. They also use a very similar blue in their ink drop logo. So when the newest Goulet-exclusive ink was announced, many people speculated that we'd see something in "Goulet blue." Liberty's Elysium, manufactured by Noodler's Inks, is exactly that lovely, cool shade of blue. It is vibrant enough to provide great contrast on white paper, but subdued enough to be easy to read. It is brighter than Waterman Florida Blue, but not nearly as obnoxious as Noodler's Baystate Blue. Like most Noodler's inks, Liberty's Elysium is highly saturated and produces a bold line with a low level of shading. It is wet writing ink that dries very quickly. Show-through was moderate on each of the paper types I tested: fountain pen-friendly Rhodia, Staples bagasse notepads, and cheap, office-quality copier paper. In my Clairefontaine notebooks, I was able to use both sides of the paper without any issues. Bleed-though was likewise very good, except where I was using wet-writing calligraphy pens. Even then, it only occurred where the ink pooled on the paper at the bottoms of letters. Noodler's Liberty's Elysium caused a moderate amount of feathering in wet writing pens and on cheap paper. This is evident in the "by comparison" section of the written review, were the "b" and "r" both suffer from severe feathering. On office-grade copier paper, and on Staples bagasse, it produced a medium line instead of a fine line. Generally, though, the feathering is tolerable – on good quality, ink resistant paper the behavior is almost non-existent. Yet, despite how wet the ink is, my single criticism of Liberty's Elysium is that is dries too quickly. Those who have read my other reviews may find this ironic, as long dry times have been my chief complaint about other Noodler's inks. However, when using my Visconti Homo Sapiens, leaving the cap off for more than five seconds causes the pen to start hard and occasionally skip on the initial stroke. Drying quickly on paper is an admirable quality. Drying quickly in my pen is less so. Regardless, on Rhodia paper, Liberty's Elysium dried to the touch in about 5 seconds. On Staples bagasse, it took about 10 seconds, but on office-grade copier paper, it was dry in less than three seconds. Liberty's Elysium was originally marketed as bulletproof ink, which caused some controversy when it was released. The term "bulletproof" isn't a regulated term, nor is it a commonly accepted industry term. It is a marketing term coined by Nathan Tardiff, the man behind Noodler's Inks, but it is one that has been applied consistently across the Noodler's line. 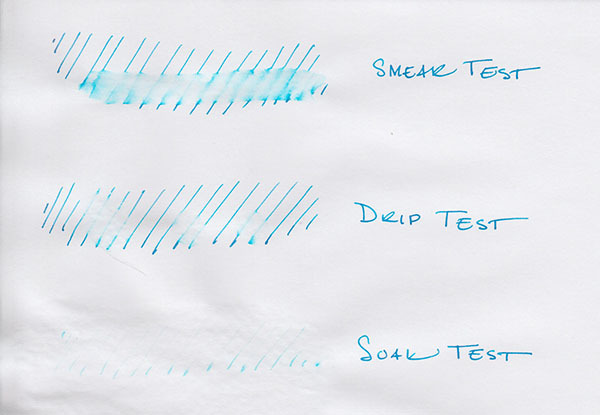 The fountain pen community has come to expect a specific set of behavior from these inks. Noodler's bulletproof inks are designed to withstand attempts to remove them from paper. The dyes bond to the cellulose in the paper and can't be washed away by water, bleach, or other methods. Therefore, they stand up fairly well to water on most paper. On coated papers that resist ink, they may sometimes smudge, as the ink that dries upon the surface is still susceptible to being washed away, but the color and intensity of the ink remain stable. The water test reveals the trouble with marketing Liberty's Elysium as bulletproof. The smear test, in which I run a wet finger across the page, results in a blue smudge and significant travel of the ink across the page. The lines are still intelligible, but they are significantly diminished in intensity. The drip test, in which I let several drops of water sit on the page before blotting them up, results in similar behavior: ink that bleeds and smudges, and is reduced in intensity. The soak test, in which I run the paper under a stream of water for thirty seconds, results in a significant portion of the ink being washed away and some feathering. This is not the behavior that most Noodler's customers have come to expect from their bulletproof ink. However, a closer look at the soak test reveals that the lines that remain are completely legible and fairly bold. It appears that the ink is partially bulletproof – some portion of the ink remains resistant to removal while the rest can be washed away. This is similar in behavior to Noodler's Black Swan in Australian Roses, which is marketed as "partially bulletproof." Consequently, Noodler's Ink and Goulet Pens have changed the designation of the ink to match, which, in my opinion, nicely solves the problem. Nathan Tardiff is a man who enjoys the study of history. Many of his inks have historic elements in both name and label design. It's the most common motif beyond the Noodler's catfish mascot. With a name like Liberty's Elysium, one would expect a historically themed label, and Mr. Tardiff does not disappoint. The label is packed with scenes from the American colonial period, including Patrick Henry's quote, "Give me liberty, or give me death!" Brian Goulet explains the meaning behind the other scenes and quotes on the label in the video where he introduces the ink. It is fair to say that the labels bring an interesting touch to an otherwise utilitarian bottle. Aside from some specialty lines, Noodler's inks are packaged in plain, 3 oz, glass bottles that are sourced from high-volume suppliers in order to keep costs down. You could easily see these bottles filled with spices in your local grocery store. The bottles are notoriously filled to the brim, so be careful when opening – make sure you've got it somewhere flat and stable before you unscrew the cap. Liberty's Elysium is great ink worthy of the great people who work at Goulet Pens. It's a beautiful blue that's just subdued enough for the office, but still interesting enough for personal use. It behaves moderately well on a wide variety of paper types, and it is one of the few blue (not blue-black) inks with this level of permanence. My only quibble is the behavior of the ink in my Visconti pen – drying too quickly in the nib. Beyond that though, the Goulets should be proud of their newest exclusive ink. Review notes: the wide strokes were made using a Pilot Parallel calligraphy pen with a 3.8mm steel nib. The medium strokes were made with a Pelikan Script 2.0 pen with a 2.0mm steel nib. The fine lines were made using a Visconti Homo Sapiens pen with an EF palladium nib. The paper is Rhodia 80gsm from Rhodia Bloc pads.